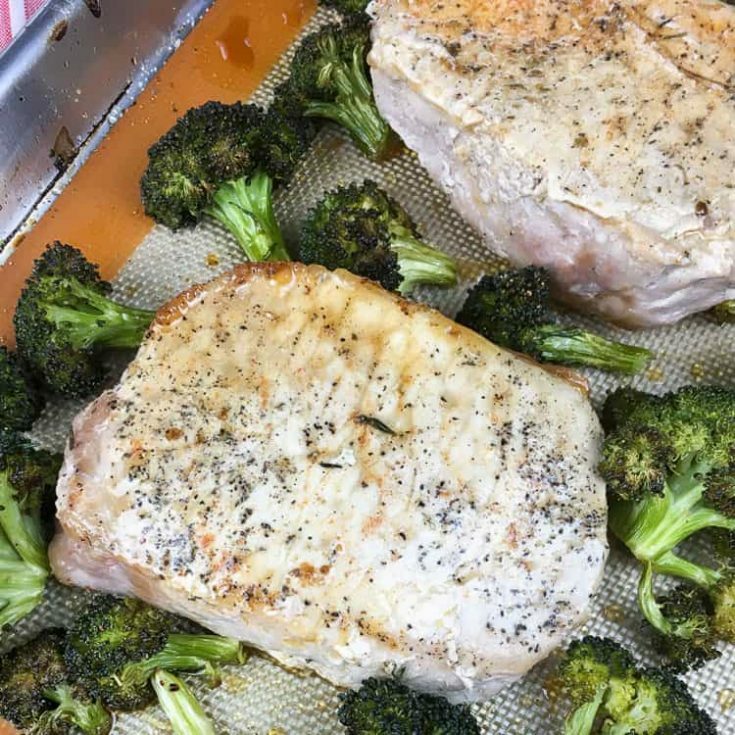 Baked Pork Chops with Garlic and Broccoli is an easy and healthy one-pan meal that will be ready for dinner in only 40 minutes. This baked pork chops recipe is perfect for those nights when you want a quick, healthy dinner with minimal clean-up. 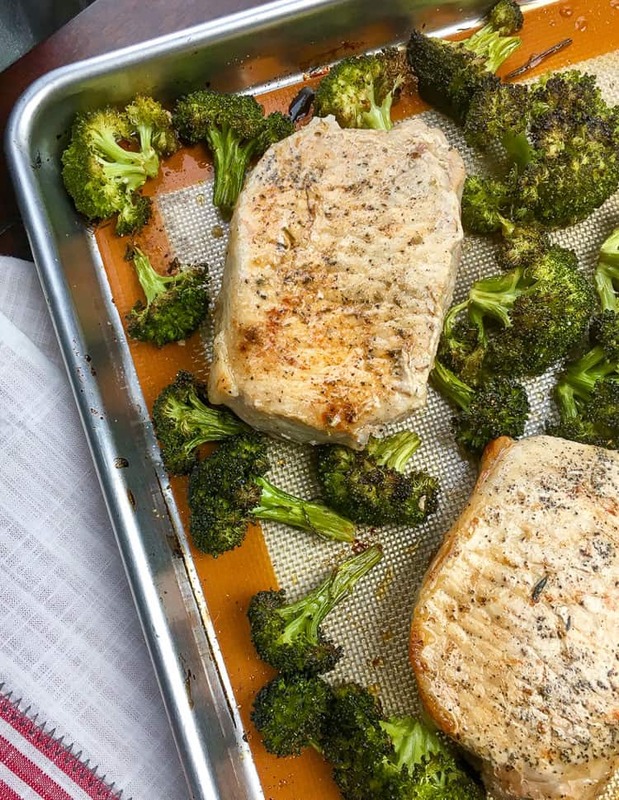 By baking the pork chops in the same pan as the broccoli, the crisply roasted broccoli absorbs the flavorful juices from the pork chops. Even better, this recipe is deliciously seasoned with garlic cloves, olive oil, salt, pepper, paprika, onion powder, Italian seasoning, and garlic powder. Your kitchen will smell amazing when these pork chops are done! It’s not because being cooked is hard work… it’s because the pork chops will taste so much better if you allow them to rest before serving. The USDA recommends at least 3 minutes, but I suggest up to 5-10 minutes. By allowing the pork chops to rest, you give the meat fibers time to relax. Relaxed meat fibers = more tender meat. It’s tempting to dig in right away, but trust me, it’s worth the wait! Meat thermometer: You’ll need to check the internal temperature of the pork chops to ensure they’ve cooked through. I love this convenient thermometer that gives you an accurate reading in just a few seconds (so you can start eating as soon as possible!). Silpat® baking mat: A silicone baking mat is a must-have for any kitchen because it makes clean-up a breeze. They’re perfect for one-pan meals like this one. I hope you enjoy this baked pork chops recipe. It will easily become a new family favorite! This tasty pork chops recipe will become a new family favorite! Preheat oven to 400°F. Line a large, rimmed baking sheet with a silicone baking mat. Add pork chops to baking sheet. Drizzle with olive oil, approximately 2 tablespoons across all 6 pork chops. Combine paprika, onion powder, garlic powder, and 1 tsp Italian seasoning in a large mixing bowl. Rub the mixture on both sides of the pork chops and return to the baking sheet. Season with salt and pepper to taste. Add broccoli to the same bowl and drizzle with remaining olive oil. Add minced garlic and remainder of Italian seasoning to the bowl. Toss to fully coat the broccoli, and season with salt and pepper to taste. 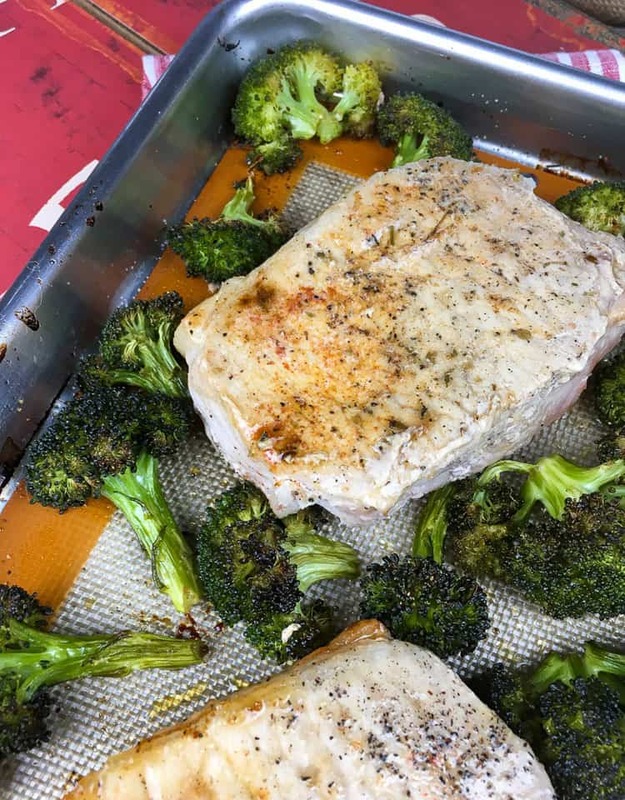 Place broccoli on baking sheet around the pork chops in a single layer. Roast baking sheet in the oven for 23-28 minutes. During the baking process, turn the pork chops once and stir the broccoli once. Baking is done when the pork chops are cooked through (test with a meat thermometer) and the broccoli is browned. When the baking is done, remove the pan from the oven. 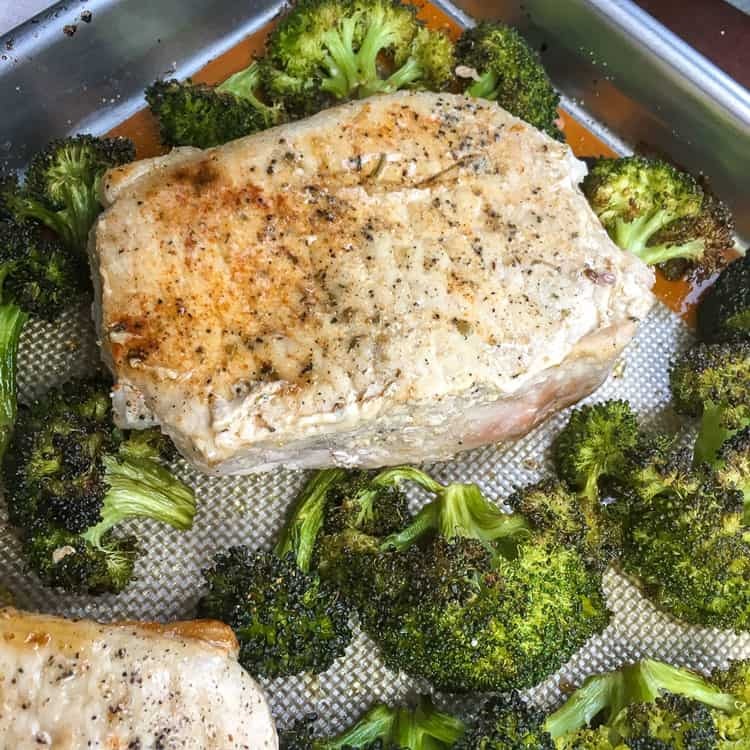 Transfer broccoli and pork chops to a serving platter and allow the pork chops to rest for 5-10 minutes. After 5-10 minutes, serve and enjoy! Always cook meat to temperature, not by time. The broccoli should be spread out in a single layer without crowding. If necessary, use a three-quarter sized sheet pan. Wonderful recipe! A family favorite. A great way to get my kid to eat broccoli!